Living up to her meeting poster girl billing, Genzebe Dibaba powered to the second fastest indoor 1500m of all time to highlight the Indoor Meeting Karlsruhe on Saturday (3), the opening leg of the 2018 IAAF World Indoor Tour. The Ethiopian’s sensational 3:57.45 run was one of five world leading performances to play out before a vociferous sell-out crowd of 4,500 at the Messe Halle Karlsruhe, but the only one likely to remain atop the world lists, unless Dibaba herself decides to attack it later this season. Clearly, Dibaba likes to race in Karlsruhe. The Ethiopian set the 3:55.17 world indoor record at this meeting four years ago on the nearby Europahalle track. She clocked 4:00.13 two years prior to that, which is, after this evening, the 10th fastest run of all-time. On this return engagement, she looked like the Dibaba of 2014, attacking her world standard from the gun. She looked eager early on, testing her patience behind the pacesetter Nelly Jepkosgei, who opened with a 1:01.16 opening 400m. That was well inside the 62.5 in Dibaba’s world record run, but too quick for Jepkosgei, who struggled in the waning stages of her 800-metre assignment. The tempo not to her liking, Dibaba forged ahead to go it alone, passing the 800m mark in 2:07.52, a second-and-a-half faster than four years ago. Unrelenting, her record assault intentions, mere whispers prior to the race, were clear by 1100m. Here the clock read 3:10.57, almost identical to the 3:10.5 en route to her record. Forging on, she finally ran out of steam midway through the final bend, but still managed to finish well under the formidable indoor four-minute barrier for the third time. No other woman can claim that achievement. While Dibaba went for broke from the outset, the race for second was a contest of patience. Kenyans Beatrice Chepkoech and Winny Chebet tried to maintain for the first 800 metres, but quick paid for those ambitions, both falling back over the next two laps. That played well into the hands of Konstanze Klosterhalfen, who often prefers to run alone. Passing the Kenyan duo, the German, who will celebrate her 21st birthday on 18 February, pushed on to eventually reach the line in 4:04.00, a personal best. Chepkoech was third in 4:08.33 and Chebet fourth clocking 4:09.45. While Dibaba was the meeting’s main global attraction, that role’s national counterpart was played by Pamela Dutkiewicz, whose star has risen considerably since she took world 100m hurdles bronze last summer in London. But Sharika Nelvis of the US rained on that parade after she emerged victorious in a blanket finish in the 60m hurdles, clocking 7.80, another world lead and nabbing ten World Indoor Tour points. Posted by OromianEconomist in Athletic nation, Marathon, Uncategorized. 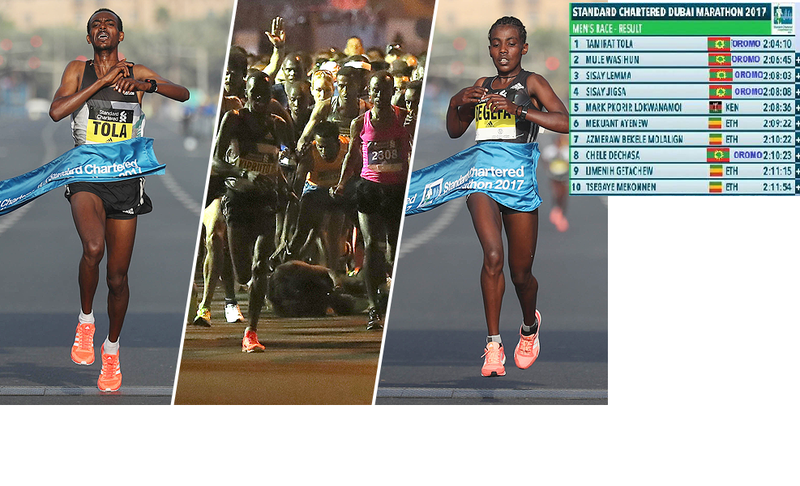 Double triumph for Oromo Marathon athletes at the Tata Mumbai Marathon as Amane Gobena and Solomon Deksisa won at the IAAF Silver Label road race in 2:25:49 and 2:09:34 respectively on Sunday, 21st January 2018. They represent Ethiopia in the competition. Meanwhile Gulume Tollesa successfully defended her title at the Standard Chartered Hong Kong Marathon with a course record of 2:29:37. Twenty-two-year-old Deksisa broke away from the rest of the field at the 35-km mark and kept his nose ahead for the reminder of the 42.195-km men’s event to lead a 1-2 finish for Ethiopia ahead of 29-year-old compatriot Shumet Akalnaw. Deksisa clocked 2 hours, 9 minutes, 34 secs, off the course record of 2:08:35, while his compatriot Shumet crossed the finish line in 2:10:00 after being in hot pursuit of the lead runner over the last seven kms without being able to catch up. Kenyan Joshua Kipkorir, second last year, ended up third this year in 2:10:30. Oromo Athlete Shumi Dechasa for Bahrain (2:12:24) is 4th. Gobena won the women’s race by a comfortable margin in 2:25:49 ahead of defending champion Bornes Kitur of Kenya who registered 2:28:48. In third place was another Oromo athlete, Shumo Genemo (2:29:41). The overall winners of both full marathons reap $42,000 each. Birke Debele (2:29:45) and Kuftu Tahir (2:35:01) completed 4th and 5th respectively. Deksisa, running his sixth marathon with a personal best of 2:06:22 that he had registered while finishing second in the Rooterdam Marathon in April 2016. Posted by OromianEconomist in Athleteics, Athletic nation, Uncategorized. Oromo athletes Almaz Ayaanaa Eebba (f) and Berhanu Legese Gurmessa (m) win 2017 Airtel Delhi Half Marathon on Sunday 19 November 2017. Berhanu Legese and Almaz Ayana won the 2017 edition of the Airtel Delhi Half Marathon which lived up to its legacy of being the World’s most prestigious half marathon, with Procam International announcing and delivering a slew of initiatives to be able to provide athletes with a better running environment. Legese led Ethiopia’s 1-2 placing with compatriot Andamlak Belihu coming in five seconds later on his debut over the distance and American Leonard Korir came third clocking 59:52. 2017 IAAF World Championships Marathon gold medalist Geoffrey Kirui finished a disappointing sixth with a timing of1:00:04. Minister of State (IC) – Youth Affairs and Sports Col (Retd.) Rajyavardhan Singh Rathore flagged off the race. Airtel Delhi Half Marathon International Event Ambassador Anthony Ervin, PUMA legend Anthony Ervin and Honourable Minister of State in the Ministry of Parliamentary Affairs and Ministry of Statistics and Programme Implementation Vijay Goel were present at the event. The mega event with a participation of over 34,000 would not have been possible without complete coordination and cooperation with the authorities. 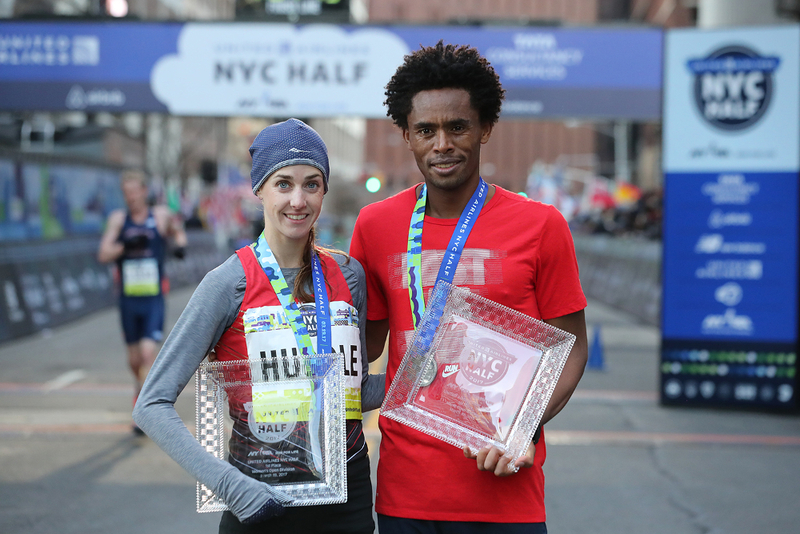 Feyisa Lilesa wins the 2017 United Airlines New York City Half Marathon while American Molly Huddle defended her women’s title. 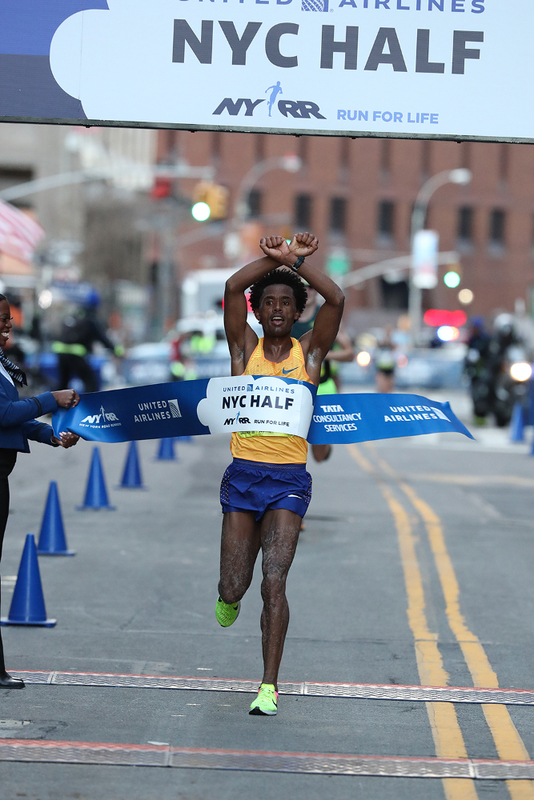 Feyisa Lilesa makes Oromo protests symbol after winning New York City half marathon. 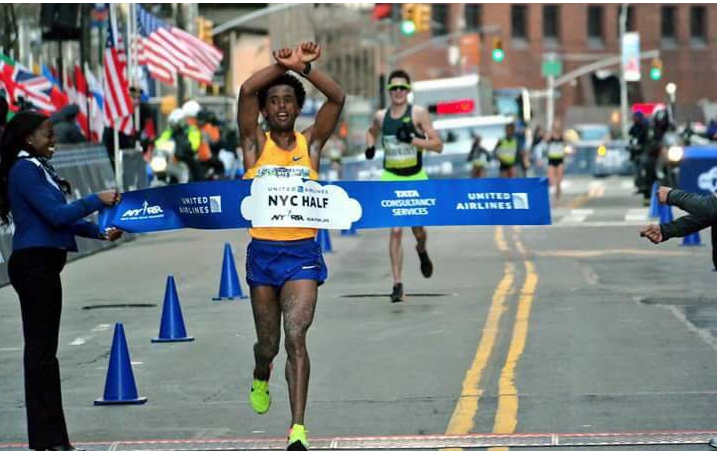 Ethiopia’s Feyisa Lilesa won the United Airlines NYC Half on Sunday and, once again, performed a protest against his home government at the finish. 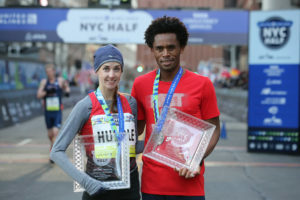 Feyisa Lilesa, who is now living in the United States following his performance at the Rio Olympics, won the United Airlines NYC Half on Sunday. Again, the Olympic marathon silver medallist, who is Ethiopian, crossed his wrists above his head, forming an “X,” in solidarity with the Oromo people, the largest ethnic group in the Horn of Africa. It’s not the first, or second, time that Lilesa has performed such a gesture. 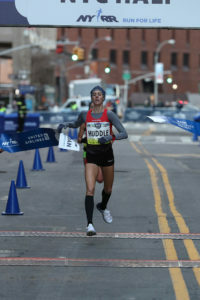 RELATED: FULL recap: United Airlines NYC Half (including Canadian results). Excluding Sunday’s performance, Lilesa has on two previous notable occasions performed what is part of the Oromo protests since the Olympics including at the Honolulu Marathon and the Houston Half-Marathon. The 27-year-old did not return to Ethiopia after the Olympics fearing for his life because of the finish line act. The long-distance specialist is currently residing in Flagstaff, Ariz. with his family recently relocating to the United States on Valentine’s Day. According to CNN, there have been protests across Ethiopia “since April of 2014 against systematic marginalization and persecution of ethnic Oromos.” The protests can be sourced to the territorial limits of the capital city Addis Ababa extending into neighboring Oromo villages displacing residents. In 2016, Ethiopian security forces “killed hundreds and detained tens of thousands of protesters in Ethiopia’s Oromia and Amhara regions,” according to Human Rights Watch. The government told Lilesa that it would be safe to return home. As seen a recent feature in the New York Times, Lilesa has received a green card as a permanent resident in the United States “for individuals of extraordinary ability in the sciences, arts, education, business and sports.” Lilesa’s finish line protests have led other runners, including several in Canada, to cross their wrists above their head at the finish line of races. Rachel Cliff (1:12:07) for eighth and Eric Gillis (1:03:49) in 16th were the top Canadians in the race that featured more than 20,000 runners. 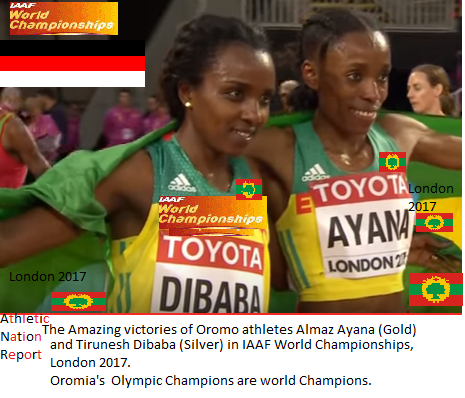 Posted by OromianEconomist in Africa, Athleteics, Athletic nation. Oromo athlete Tirunesh Dibaba, winner of the last two Olympic titles, overtook early leader Alice Aprot of Kenya to get the bronze medal in 29:42.56, a lifetime best that was 14 seconds faster than the previous Olympic record she set in 2008. An Oromo athlete, Almaz Ayana, becomes the fastest runner ever seen before. She ran the fastest 10 000m race in history in 29:17.45 during the 2016 Summer Olympics beating the previous world record by more than 14 seconds, a record that Wang Junxia had held for 23 years. Junxia had held for 23 years. Almaz Ayana Eba (born 21 November 1991) competes in the 3000 metres and 5000 metres event. She set a new 10000 metres world record, breaking the old one set in 1993, during the Rio 2016 Summer Olympics. She won bronze medal in 5000 m event at the 2013 World Championships in Athletics held in Moscow, Russia. In the 2015 IAAF World Championships in Beijing, Almaz won the 5000m course beating Genzebe Dibaba by a long distance. Almaz won her first senior title over 5000 metres at the 2014 African Championships in Marrakech, defeating favourite Genzebe Dibaba in a championship record time of 15:32.72. One month later in the same stadium, she won the 5000m representing Africa at the 2014 IAAF Continental Cup by over 24 seconds. Almaz ran a personal best of 14:14.32 over 5000 metres at the IAAF Diamond League meeting in Shanghai in 2015, improving upon her previous record of 14:25.84 which she had set in Paris in 2013. This made her the third fastest female athlete over that distance, behind compatriots Tirunesh Dibaba, the world record holder, and Meseret Defar. 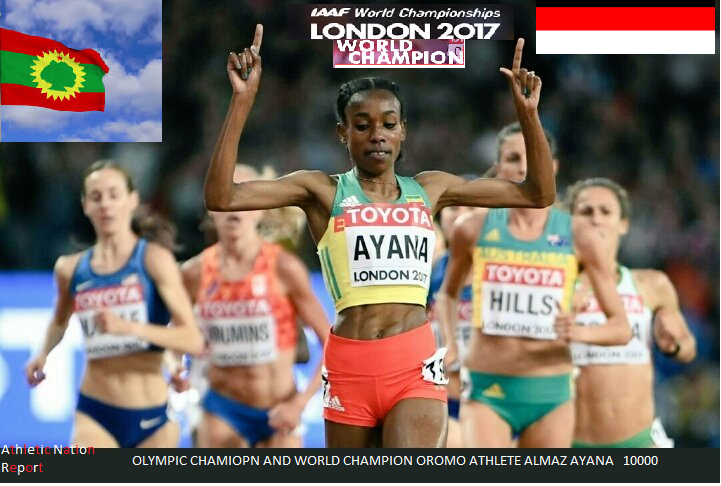 On June 2, 2016 Almaz Ayana ran 5000 metres in 14:12.59 at IAAF Golden Gala in Rome. This made Almaz the second fastest woman ever on 5000 metres, second only to Tirunesh Dibaba, who holds the world record of 14:11.15. 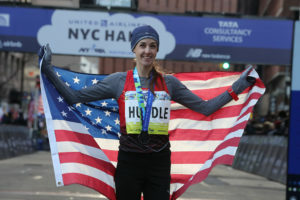 The Oromian athlete representing Ethiopia takes 14 seconds off a 23-year-old mark; Molly Huddle breaks the U.S. record. Last year’s world champion, Vivian Cheruiyot of Kenya, took silver in 29:32.53, just off of the previous world record of 29:31.78, set by Wang Junxia of China in 1993. Oromo athlete Tirunesh Dibaba, winner of the last two Olympic titles, overtook early leader Alice Aprot of Kenya to get the bronze medal in 29:42.56, a lifetime best that was 14 seconds faster than the previous Olympic record she set in 2008. Molly Huddle of USA finished sixth in 30:13.17, an American record that took 9 seconds off the mark Shalane Flanagan set while winning bronze at the 2008 Games. Emily Infeld finished 11th in 31:26.94, a personal best. The third American, Marielle Hall, finished in 33rd in 32:39.32. Aprot, who had the world-leading time heading into the race, set a fast pace from the start. She led a group of seven through halfway in 14:46.81, just off of world record pace. 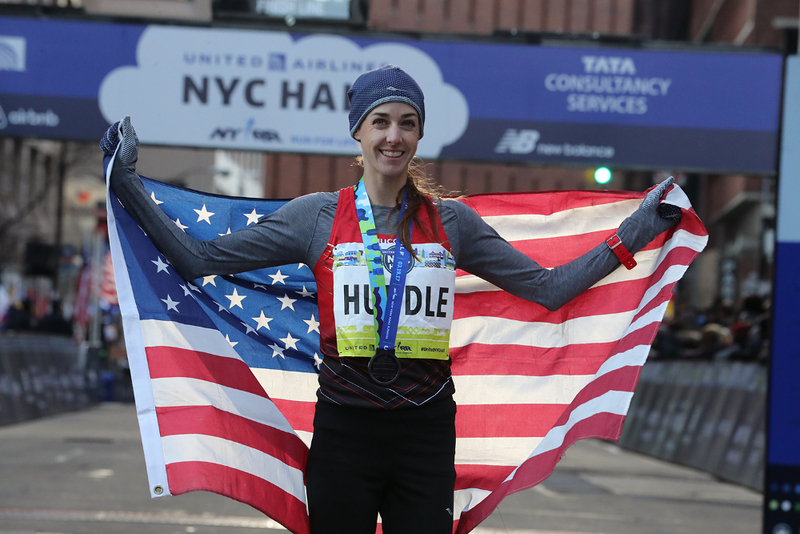 Huddle ran with the leaders through the first four kilometers, but then fell off, which is understandable given that the leaders passed 5,000 meters just 4 seconds slower than her U.S. record at the distance. But even Aprot’s pace was too slow for Ayana, who surged into the lead and broke the pack apart with 12 laps to go. She used the same punishing solo front-running style to break Genzabe Dibaba (Tirunesh’s younger sister) in the 5,000 at the world championships last year. Cheruiyot, who has a strong finishing kick, kept Ayana within a few seconds for several laps, but then couldn’t hang on, leaving only the question of by how much Ayana would break the world record. Ayana, the second fastest in history at 5,000 meters, is new to the 10,000; her Olympic title and world record was only her second time contesting the distance. Three-time Olympic champion Kenenisa Bekele won the men’s race at the Great Manchester Run, finishing the 10km course in a time of 28 minutes and eight seconds. Tirunesh Dibaba made a winning return to competition after a two year hiatus and she also created a small piece of history by becoming the first woman to claim three victories in the Great Manchester Run, an IAAF Gold Label Road Race, on Sunday 22 May 2015. After a relatively sedate first half, the pace began to increase with Kipsang taking the initiative and by the 8km mark which was reached in 22:40, the pre-race favourites had forged nearly eighty metres on Robertson. Bekele said before the race he wasn’t expecting a fast time so soon after finishing third in the London Marathon but the two-time Olympic 10,000m champion, who took a short break after finishing third in the London contest, still broke the tape in 28:08 –after a 13:52 second half– which was faster than his winning time two years ago. 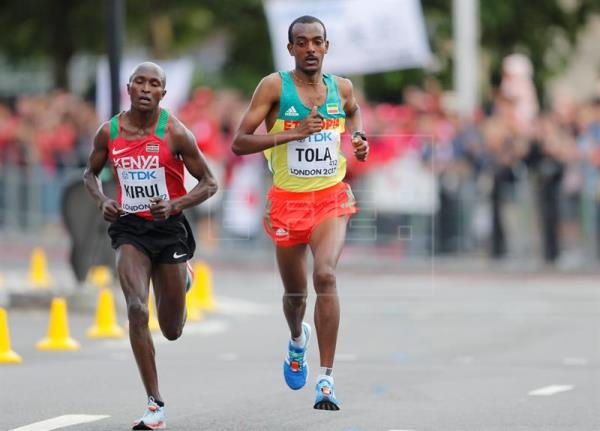 But his chance of winning a fourth Olympic title later this summer appears to be in the balance with the news that he was only named as a reserve on the Ethiopian marathon team. Kipsang also missed out on selection for the Olympic Games, although his chances were thwarted after he took a heavy fall at a drinks station around the 10km mark. He said his leg – which became painful after the 25km checkpoint in London – feels fine now, although he still feels some pain in his shoulder. And had he not fallen, Kipsang is confident he would have kept pace with Eliud Kipchoge and Stanley Biwott in London, who ran 2:03:05 and 2:03:51 respectively. Posted by OromianEconomist in Athleteics, Athletic nation. Oromo athletes Lemi Bernanu Hayle and Atsede Baysa won at the 2016 edition of the Boston Marathon, the 120th running of the IAAF Gold Label Road Race, crossing the line in 2:12:44 and 2:29:19 respectively on Monday (18). It was the first time in the Boston Marathon race’s 120-year history that Oromo athletes representing Ethiopia had swept both the titles. Atsede Baysa rallied after falling more than 30 seconds off the pace, overcoming the deficit with a strong push through the final four miles to win the women’s Boston Marathon on Monday. 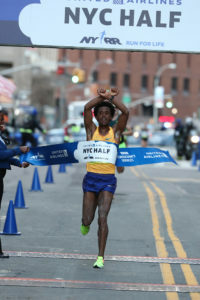 Lemi Berhanu Hayle won the men’s race after breaking away from defending champion Oromo athlete Lelisa Desisa. Hayle won in 2 hours, 12 minutes and 45 seconds. The men’s race stumbled through halfway in 1:06:43, looking for someone willing to take command into a slight headwind and with temperatures rising to around 20 degrees Celsius. Only Hayle stuck with Desisa’s big push, and from that point the race was primarily an Oromo duel for supremacy. Initially Desisa let Hayle set the pace and hovered behind him waiting to move but he then came to the front and began actively trying to shake the younger runner. Hayle, at 21 already a winner in Dubai in 2015 and runner-up there this January, also had previous wins in Warsaw and Zurich. He was confident in his ability to win and his speed – with a best 2:04:33, he was third-fastest among the starters – but had never before a race as big as Boston. Ultimately Hayle took over at the very end, side-by-side with Lelisa through 40km but then taking charge before the mile to go mark in Kenmore Square and opening a gap of 47 seconds back to the tiring Desisa, who held on for second in 2:13:32. Baysa, 29 and a two-time Chicago Marathon winner came from 37 seconds at the 22-mile mark to overtake the two women in front of her. She passed fellow Oromo athlete and sometime training partner Tirfi Tsegaye with two miles left, the latter finishing second in 2:30:03. Kenya’s Joyce Chepkirui, who was disputing the lead with Tsegaye at 22 miles before Baysa started her long charge for glory, was third in 2:30:50 while fellow Kenyan, defending champion Caroline Rotich, dropped out barely five miles into the race. The women’s race also started slowly, and it ultimately fell to Kenya’s Joyce Chepkirui to take charge of the pace, although as usual the lead changed frequently in the early miles while efending champion Caroline Rotich stepped off the course at 7km and ultimately dropped out. Halfway was reached in a pedestrian 1:15:25 and the leaders were close enough that Latvia’s star Jelena Prokopcuka tangled with Oromo athlete Fatuma Sado and knocked the latter’s right shoe loose. Much like the men, the women rolled down into Newton Lower Falls at a decent clip but slowed when they met the first hills. Unlike the men, the pack which rode that roller coaster had thinned to four, featuring Tirfi Tsegaye and the Kenyan trio of Chepkirui, Valentine Kipketer and Flomena Daniel; with Baysa well off the back. After Tsegaye and Chepkirui shook the other pair off, it looked like the women’s race was coming down to a head-to-head duel as well, but Baysa had other ideas; she found a second life after cresting the Newton hills at mile 21. With Tsegaye frequently twisting around to try and gauge the progress of her sometime training partner, Baysa closed a deficit which had grown to 37 seconds at 22 miles, when she moved into third place. At 40km, Baysa started pulling clear, and she built a lead of 44 seconds, with Tsegaye second in 2:30:03. Unlike Hayle, Baysa has a lengthy marathoning resume including victories in Chicago in 2010 and 2012, as well as wins in Saitama, Paris (twice), Xiamen, and Istanbul. Like the men’s race, the women’s winner was faster in the second half. Baysa passed halfway in 1:15:32 and ran the hilly second half of the race in 1:13:47. Both Kenya and Ethiopia have indicated that Boston results, along with next weekend’s race in London, will figure in selection for their Olympic team. However, the defending Olympic champion Tiki Gelana was never a factor in the race, finishing 14th in 2:42:38 and Buzunesh Deba, a frequent contender both here and in New York and the only woman in the field to have run under 2:20:00 in Boston, was seventh in 2:33:56.